Named by the Vikings for it’s lovely location on the water, the county of Waterford has long been a centre of trade. This accounts for the variety of surnames that can be found in both the city of Waterford, and the county. Céad Míle Fáilte – and welcome to this week’s Letter from Ireland. Last week, I spoke about the various surnames in Ireland of Viking extraction – and it’s always amazing the amount of replies we receive when mentioning the the word “Viking” in any letters. We seem to have an endless fascination and respect for their adventures and endeavours. I’m having a nice cup of Lyon’s tea as I write – and I do hope you’ll have a cup of whatever you fancy as we start into today’s letter. This week, I thought it would be nice to continue the Viking theme and have a look at another Irish county (and its surnames) that receives its name from one Viking town that founded on the south coast of Ireland. That town was called “Vedrafjörður” in old Norse but was anglicised as “Waterford” over the years. Later on, this Hiberno-Norse City gave its name to the entire County of Waterford. The Irish Surnames of County Waterford. I do hope you enjoyed that short highlight of the scores in the game. How about you – did any of your Irish ancestors come from County Waterford? Do leave your comments below and let me know. I understand, for example, that many people in Newfoundland still speak with a Waterford accent following so much migration from that area in the late 1700s. Before the area of Waterford became a county – and before the coming of the Vikings and the later Norman and English families – this area of Ireland was known as the Kingdom of Déise (pronounced “daysha”). Even today, the battle-cry at Waterford hurling games is “Up the Déise!”. The Déisi Mumhan tribe were found in modern County Waterford and north into modern County Tipperary. The chief families of the area were the O’Brick and the O’Phelan/O’Whelan families. However, with the coming of the Normans in the late 1100s, the mighty Power family became the dominant family until the 1600s, and to this day the surname Power is the most numerous in County Waterford. Ahearne, Byrne, Casey, Coleman, Crotty, Curran, Daly, Drummy, Duggan, Dwyer, Flynn, Foley, Hannigan, Hayes, Keane, Kiely, Maher, McGrath, McCarthy, Moloney, Morrissey, Murphy, O’Brien, O’Meara, O’Donnell, Phelan, Quealy, Ronayne, Ryan, Sheehan and Whelan. Barry, Burke, Butler, Condon, Dalton, Fitzgerald, Hackett, Landers, Nagle, Power, Sliney, Terry, Tobin, Veale, Walsh and White. And do you know what? You will find many of these surnames on the jerseys of the mighty Waterford hurlers. 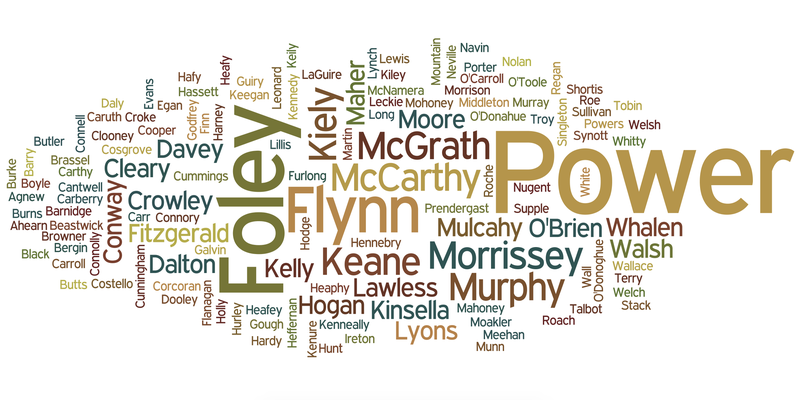 How about you – do you have any of these Déise Surnames in your Irish family tree? Do leave your comments below and let me know. That’s it for this week – and we do look forward to you joining us again next week – and the best of luck to County Waterford in the All-Ireland Hurling Final. Thank you. I understand that my Great Great Grandparents may have been from Waterford (William Kiely/Mary Cullian. My Great Grandfather J W Kiely (born) 1856, who came out to Oz, and his siblings are all noted on Kilsheenan and /Kilcash Diocese of Waterford and Lismore. I once saw a Canadian cop show from the Maritimes. A bit puzzled by the accent until I done some research. Thanks to you & Carina, I learned that my Dad’s mother’s surname of Powers is really not Irish, but Norman French “LePoer.” I believe my gr.gr. grandpa John Powers was from Kilkenny, Co. Waterford; according to a Roman Catholic marriage entry (Canandaigua, NY) and naturalization application (Ontario County, NY). Difficult as this is a common name! i have found my surname spelled two different ways. Daly and Daley, we spell it Dailey. My grandmother was a Coleman. I am from Virginia, but I have always felt that I am Irish at heart!